studied under many illustrious masters as a young child. He gave profound Kagyu teachings to the famous Nyingma master of Katok monastery, who in turn shared his Nyingma teachings. 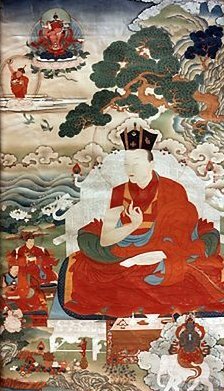 Changchub Dorje left troubled Tibet in order to make a pilgrimage to India and Nepal, accompanied by the Situ, Shamar, and Gyaltsab Rinpoches. In Nepal he was thankfully honored by the king for stopping a raging epidemic and for making rain to end a serious drought. The pilgrims continued on to India, visiting the places of Lord Buddha's birth and death. The young Situpa, who impressed Indian Buddhist scholars with his erudition, became a master of languages and went on to be one of Asia's greatest scholars of all time. Returning to Tibet, the Karmapa accepted an invitation to China, and set out for that land accompanied by the Shamarpa. However, foreseeing difficult political times ahead and realizing the need to leave his body, the Karmapa sent the Tai Situpa a letter with details of his next incarnation and succumbed to smallpox, as did the Shamarpa two days later.